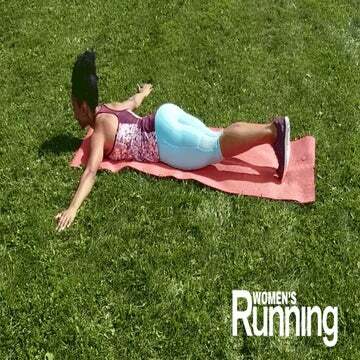 Women's Running brings you the pendulum hip flexor strengthening exercise as part of our Quick and Easy Injury Prevention video series. Women’s Running introduces the first video in its Quick and Easy Injury Prevention series: the pendulum hip flexor exercise, performed by Megan Lizotte of Hit the Ground Running. Megan Lizotte is a two-time USA Olympic Marathon Trials qualifier, five-time IAAF World Mountain Running Championships qualifier, eight-time Team USA competitor, USATF Trail Marathon National Champion and the first American woman to win the historic Sierre Zinal Mountain Race in Switzerland. She is mom to Maven (5) and Bodie (18 months) and lives in San Diego, Calif. with her husband Andrew. In addition to professional running, Megan is a writer, running coach and athlete-mama mentor. She helps runners of all abilities reach their personal goals and more recently developed running, fitness and nutrition programs for new moms trying to juggle motherhood with “all the things.” Megan has run a 2:41 marathon and 2:44 pregnant-marathon. You can follow Megan on Instagram and Twitter at @MeganLizotte or connect via email: megan@meganlizotte.com.